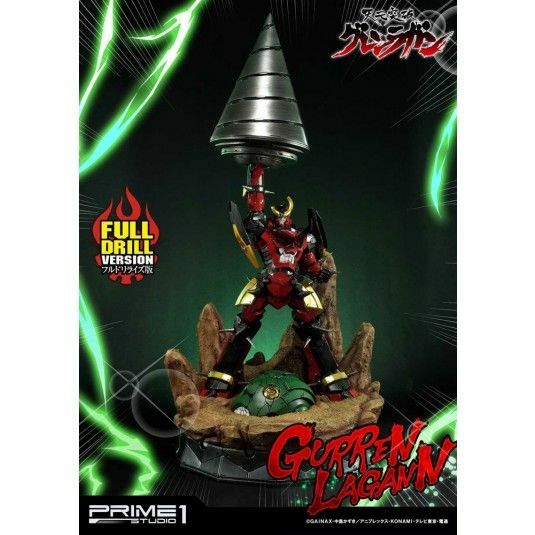 Prime 1 Studio is proud to present UDMGL-01FD: Gurren Lagann Full Drill Version from Tengen Toppa Gurren Lagann (Anime). Gurren Lagann Head, Lagann, has always been piloted by Simon, while the body, Gurren, was originally piloted by Kamina, who was then succeeded by Rossiu, and eventually Viral in the second story arc. While the Gurren Lagann has mainly been piloted by the series' main protagonist, Simon, most of the plot has almost always seen both cockpits occupied regardless of the Gurren pilot's involvement in the gunmen's endeavours. This Ultimate Diorama Masterline Gurren Lagann series brings to life the popular Japanese animation, crafted with attention to details and true to the design of the character. Gurren Lagann statue stands at an impressive 40 inches tall with a key visual that everyone who knows Gurren Lagann will remember this scene. This is the ultimate piece for all Gurren Lagann fans.